For years we have been told, “Think outside the box”. According to Luc De Brabandere and Alan Iny, strategic consultants at The Boston Consulting Group, there is one fundamental flaw in thinking in this manner: It is difficult! 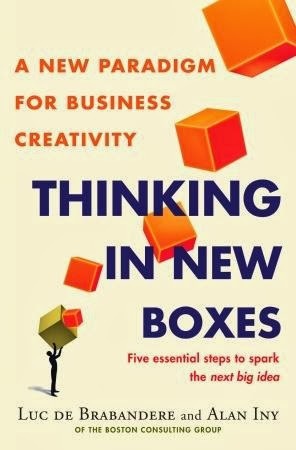 So, in their new book Thinking In New Boxes, the duo teach you five essential steps to spark the next big idea. You need to use a range of existing mental models to simplify things. Your mind relies on pre-existing categories that it has already created. (Consider that German psychologist Gerd Gigerenzer has argued extensively on how heuristics play a role in decision making). Brabandere and Iny suggest that boxes are sketches, your mind’s way of simplifying, naming, and framing things, so that you can determine how best to respond to them. But, thinking outside the box is not enough! 3. Even if you do manage the trick, and get out of a specific box, it often isn’t enough – you still need a new one. Each step in the five-step framework builds upon the “theory of the box” and on an understanding of how the human mind actually thinks and reasons. As creative thinkers, or business leaders, we always need to push the limits of our creativity. Businesses pay lip service to its importance and employees are pushed into repetitive processes that always focus on doing the more with less. This isn’t creative and certainly not ground breaking. However, by using our existing boxes, we take advantage of our already acquired experiences and expand on these by thinking in new boxes. The book is by no means all talk. It provides scenarios and exercises to help you understand how to develop strategies that you can use in your own creative process. You will learn how to create and use boxes. Look around: examples abound of how companies have transformed: from Apple to Google, from Bic to Philips, Thinking in New Boxes have helped in rejuvenating old and creating new markets.